Thinking about selling on eBay but not sure where to start? You’re not alone. The average household has well over $1,000 worth of unwanted or unused items. 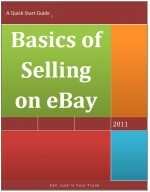 Learn the basics from our free guide to selling on eBay. Download our free Quick Start Guide and get started today selling on eBay!